I know it’s hard to believe, but Halloween is just around the corner. And while we’ll probably see plenty of Harambes and Pepes this Hallow’s Eve, there will be plenty more Trumps and Hillarys. But if you’re a Trump supporter and want to dress up as the Great Fascist Tangerine himself, you’re going to run into one problem: every Trump mask seems to be made in China or Mexico. This past weekend I was walking down Hollywood Boulevard with a friend who’s from out of town, showing off our fine city’s glitz and glamour. Just kidding. Los Angeles is a pit of mental and economic despair that’s perpetually 72 hours from unbridled chaos. But I digress. We were walking along Hollywood Boulevard when we happened upon a great costume shop that had plenty to offer for political junkies. There were Obama masks, John McCain masks, Bill Clinton masks, Richard Nixon masks, and everything in between. And, of course, there were Trump and Hillary masks. The store had some of their Trump masks donning his famed and not at all tacky Make America Great Again hats, while they also had Hillary’s mask sitting on a dummy in a jumpsuit. The store’s Dummy Hillary was sitting in jail behind bars. Emails, amirite? The store was an equal opportunity caricature artist, as any great Hollywood costume shop should be. But when I asked to see the Trump masks, I was amused to see that both of the versions they had for sale were made outside the United States. 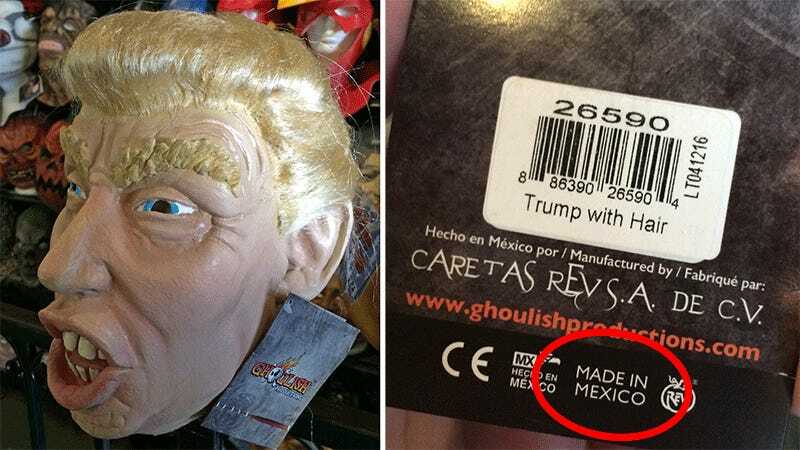 The first one I looked at, made by Ghoulish Productions, was manufactured in Mexico. The second one, seen below, was made in China. If you’ve accidentally walked by a television set in the past 14 months, you’ll know that Mr. Donald Trump is no fan of either Mexico or China. His largest beef with these countries is America’s trade policies that send US manufacturing jobs to them. The manufacturing of say, Donald Trump masks. This, of course, isn’t Donald Trump’s fault. He’s not manufacturing these masks. And a diehard Trump supporter could rationalize the purchase of these masks as a great protest against globalization. Or something. I don’t know. I’m trying to get inside the head of a Trump voter and it scared me, quite frankly. Add some VHS static, and it looks like a deleted scene from Videodrome. And with a limited run of 1,000, it’s not clear that any of these mask are still available, even if you wanted to buy that horrifying thing. The other thing about buying online is that it’s hard to verify what’s truly “Made in the USA.” There appear to be some cheap flat paper masks that are made in America, but there’s absolutely no way to verify that claim made by these sketchy independent sellers. I don’t expect any of the big national chains to carry Trump masks that are made in America before Halloween, but that’s okay. I don’t expect Donald Trump to have the same positions on trade by Halloween either. Good luck and stay safe out there folks. Halloween isn’t the only time when monsters are wandering America. Has Donald Trump Ever Used a Computer?